Today I am talking about Vegetables. That's right. Vegetables. And not just any vegetables-green ones. I know, what's this world coming to. I just, struggle with vegetables-ESPECIALLY green ones. I WANT to like them, I dooo! But, I don't. Thusly, I'm consistently on the hunt for new ways to trick myself into eating them. Because, ya know, I'd like to be healthy. When I found this recipe I knew it was a possibility. I hate broccoli. But, I love garlic. So...yeah, I thought this might be a thing to try. Worse came to worse-Michael would eat it! Now I have good news and bad news. Good news: I ate 4 whole pieces of broccoli! Bad news: That was all I could do before the broccoli flavor caught up to me. Michael polished off the rest. A partial victory. I will take it. And I'm sure those of you who aren't as crazy as me will definitely love it. From a Couple Cooks "Roasted Broccoli with Garlic"
Wash and dry the broccoli. Cut broccoli into large florets. Cut garlic cloves into quarters. Roast for 20 minutes (until the tips are just browned). 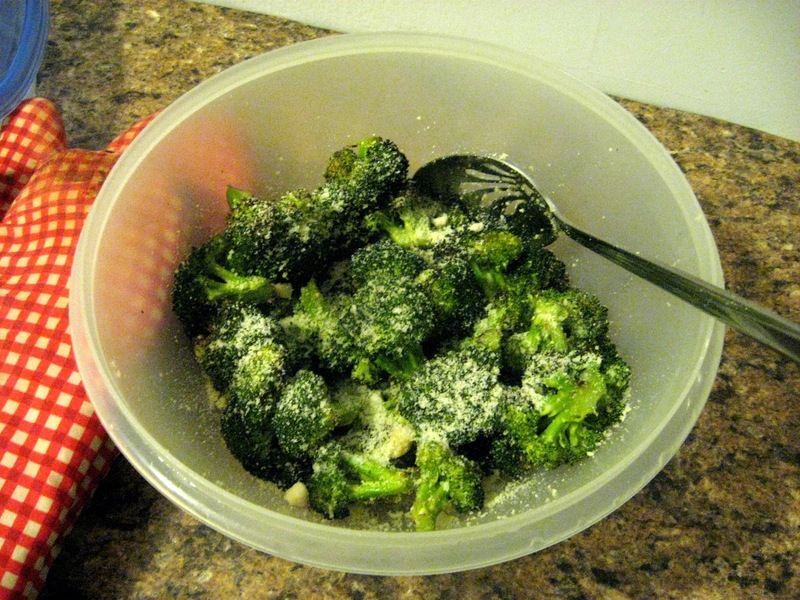 In a bowl, combine the broccoli and Parmesan. I eat broccoli every day. Its a great vegetable and there are so many ways to prepare it.